Sea the Moon and Australia could be set for an epic Prix de L’Arc de Triomphe showdown following the former’s stunning German Derby success. The unbeaten Markus Klug-trained colt stormed to an 11-length victory over nearest rival Lucky Lion in Hamburg, fully justifying his position as the 9/5 favourite. And now a titanic tussle with Aidan O’Brien’s English Derby winner Australia could be in store with both charges priced up for an Arc assault in the autumn. 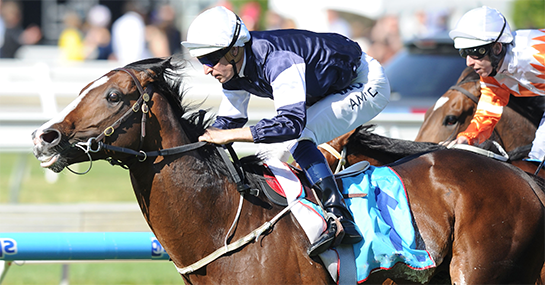 Ladbrokes go 7/1 about a Sea the Moon victory while Australia remains the market leader at 4/1. While the chances of both meeting are likely to remain the subject of mere speculation in the short-term, Sea the Moon’s impressive score has certainly re-ignited the market. To supplement the son of previous Arc winner Sea the Stars would cost €120,000 while O’Brien has remained coy about the prospect of sending his stable star to Paris with the distinct possibility that the ground will be on the soft side in October. September’s Grosser Preis von Baden is likely to be Sea the Moon’s next assignment with O’Brien hinting that he’d like to drop Australia to 1m2f in a bid to land the Juddmonte International Stakes at York and the Irish Champion Stakes at the Curragh. Watch Sea the Moon romp to victory in the German Derby! Should the mixed messages over Sea the Moon and Australia’s Arc ambitions persist then don’t be too surprised to see attention turn back towards last year’s heroine, Treve. Subsequent defeats in the Prix Ganay and most recently in the Prince of Wales’s Stakes may have taken some of the shine from the Christiane Head-Maarek-trained filly. But a return to home turf could well do the trick with the 6/1 Prix de L’arc de Triomphe chance a worthy adversary.